After a quick stop in Auckland for the night, our group set out for the Bay of Plenty via bus early this afternoon. 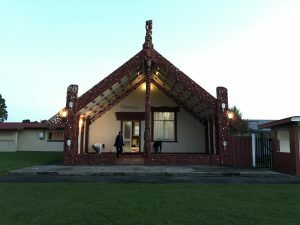 Our destination was the Hairini Marae, located about four hours southeast of Auckland, in Tauranga. During the long and windy bus ride, I had ample time to reflect on our journey to this point and take in the stunning landscape rolling past the windows. I realized that most our time in Aotearoa (New Zealand) is already behind us; we will be spending three nights at the marae and one more night in Auckland before the conclusion of the program. I thought about how my understanding of the issues of sovereignty, environment, and representation have evolved with each new day, along with my understanding of Maori identity and culture. I reflected about the ways I can incorporate some of the knowledge I have acquired once I return to Seattle and resume my studies of psychology and education. I talked, laughed, and slept. The tail end of a rainbow seen during our travels from Auckland to Tauranga. At some point during all of this, a rainbow became visible in the distance. After admiring it briefly, Racquel and I joked about finding the “pot of gold” at the end so that we could get rich. Although the exchange was not meant to be serious, I found myself reflecting on how the rainbow and the joke relate to Maori identity. When visiting with MP Meka Whaitiri at Parliament in Wellington, she informed us that out of the entirety of New Zealand that belonged to Maori before white settlers came here, only about 5 percent of the land was still under Maori control. 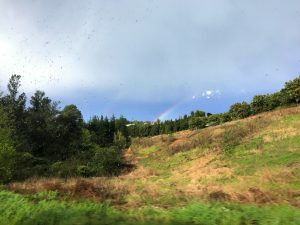 Knowing this fact and seeing how various Iwi (tribes) interact with their land and spaces, I began to think that Hairini Marae was a “pot of gold” of sorts. Because the Maori have a deep connection with the land, and because so much of that land no longer belongs to them, places like the marae have become isolated treasures. 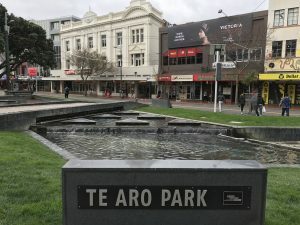 Instead of finding gold and becoming financially rich, Maori find cultural gold and enrich their identity through connection with land. When we arrived at Hairini Marae, I knew that our class had found the pot of gold at the end of the rainbow. The Ranginui whare on Hairini Marae, where we will spend the next three nights. This entry was posted in Our Experiences and tagged Aotearoa, Hairini, Maori on September 11, 2017 by mj4881. Hello! My name is Matt Knutson and I am going to be a senior at UW Seattle in the fall. I was born in Tacoma, WA and currently call Gig Harbor home while I’m not studying. Both of my parents attended UW and my younger sister just completed her freshman year there as well, so we are quite the Husky family! I am a psychology major and am also working on minors in ELS (Education, Learning, and Society) and diversity. I am also a volunteer for UW Dream Project, which works with high school students in the greater Seattle area to promote social justice and college access. During the 2017-2018 academic year, I will be a member of the 9/10th grade outreach program of the Dream Project, which specifically works with underclassmen. I am very excited to coordinate events and create material that will hopefully make a difference in student lives. After I complete my senior year, I plan to go to graduate school for Educational Psychology and would love to work as a school psychologist upon completion of that degree. I enjoy both playing and watching sports; I am a diehard Husky football fan and love the Seahawks and Mariners too. I also enjoy running and playing golf, especially with my dad, as it allows us to spend valuable time together while also doing something active and healthy. Both of my parents grew up in Bellingham, WA and many members of their family still reside there, so I consider the town my second home. 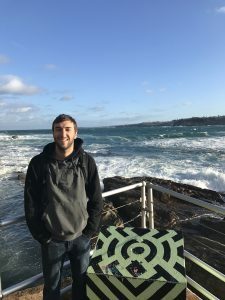 Photo of me at Bondi Beach in Sydney, Australia. In my studies of psychology and education, and through my time in Dream Project, I have developed a specific and unique way of viewing the world. I spend many of my days pondering social injustice and how it affects people, especially in the world of education. Many problems in the classroom stem from a lack of understanding between teacher and student, which can lead to countless negative outcomes for students who are left feeling marginalized and forgotten. I am passionate about fighting against this historical tendency, which is one of the main reasons I was so interested in this study abroad opportunity. I am so excited for the complete cultural immersion into Maori culture that will take up my next few weeks, and I cannot wait to incorporate what I learn abroad into my academic life at UW and into my future career! This entry was posted in Author Bios on August 28, 2017 by mj4881.